On page five of the October 20, 1862 New York Times, sandwiched by an advertisement for a St. Vincent de Paul fundraiser and a notice regarding the abrupt cancellation of a horse race, there appeared a brief article, headlined “Brady’s Photographs,” in which a Times reporter reflected on his visit to an exhibit at the Mathew Brady gallery, on lower Broadway. “The Dead of Antietam,” as the exhibit was titled, featured several score images made one month earlier in the rolling hills of western Maryland, where soldiers of the North and South had just wrought upon one another a collective 23,000 casualties (including 3,650 deaths) in a matter of 12 hours. The purpose of the exhibit, however, was not to enlighten citizens as to the nature of the war in which they were engaged, or to celebrate the slim Union victory—the object was sales. Photography in 1862 was a souvenir—not yet an educational or art—business, and Brady, a successful celebrity portraitist before the war, had been trying to branch out into battlefield photographs since the conflict’s onset, when he ventured to Bull Run only to lose negatives and equipment while fleeing with the routed Union troops. Antietam, 14 months later, was his breakout battle, offering up the unburied dead splayed in pasture, trench, and road, or arrayed in rows for shallow burial until retrieved by family or transferred to military cemetery (or, as it turned out, consumed by local hogs). They were, it should be noted, Confederate dead. Brady’s photographer, Alexander Gardner, arrived two days after the battle ended, and the Union fallen had been removed. What was clear, in any event, to the viewers bent over the gallery display cases—some of them wielding magnifying glasses, according to the Times—were elements of battle never before seen in publicly displayed photographs: masks of dried blood, gaping mouths, swelled abdomens and chests, and arms and legs that rigor had curled into gesture. Clear as well was the debris field of packs, shells, broken trees, overturned wagons, and upturned horses, along with drifts of papers that foraging Union victors had cast aside while searching the dead for what was useable. Over the remaining two and a half years of combat, Antietam’s dead were joined in their odd immortality by the dead of Chancellorsville, Vicksburg, Gettysburg, Chickamauga, Cold Harbor, et. al. Professionals like Brady and Gardner (who founded his own studio after Antietam), along with camp followers and town portraitists, created more than 10,000 known images of the war. Most of the photographers took a documentary approach, but some tailored their pictures to suit the market, especially Gardner, who concocted several imaginative tableaux at Gettysburg, in one case moving a corpse (including its fallen hat and rifle) from an open field, where he originally photographed it, some 40 yards uphill to furnish a rocky redoubt that Gardner dubbed “the sharpshooter’s den.” It became one of his most famous—and one assumes, profitable—works. The illustrations are, of course, no such thing. First, they are the creation of Gardner, who even if he hadn’t yet gotten up to the confections of Gettysburg, was a craftsman who worked angles, crops, “honest sunshine,” and shadows to get what he was after. And they were the creation of Brady, who sold postcard-sized prints for two bits. And they became the creation, too, of Holmes, a physician, when in his essay he declared them a metaphor for required surgery; and of Lincoln, who later thought to see God’s justice in such scenes, the letting of blood by sword to match the accrued letting of blood by lash. And they were the creations, too, of each man and woman who bent over them in October 1862 and ever since, demanding meaning. 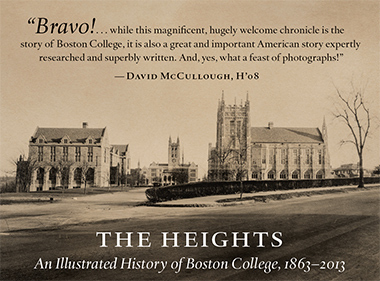 Our story on images of America begins here; our interviews with Boston College veterans begin here.